After dreaming, scheming, and then implementing over the last 5 weeks, our master bedroom decorating project is DONE! 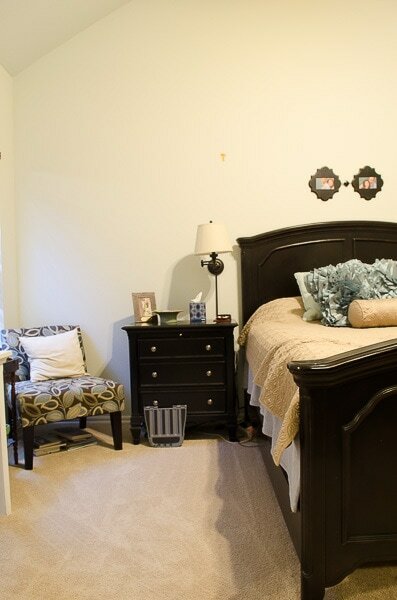 We went from a messy, generic space to a bold, but relaxing bedroom that has personality in spades. I’m going to TRY to keep the talking to a minimum because I know on reveal days we all want to see the photos. But gosh darn it, there is so much I want to SAY. Conciseness is not my biggest skill. I’ll do my best though! Just ONE little thing first. I couldn’t have finished this room without lots of help. 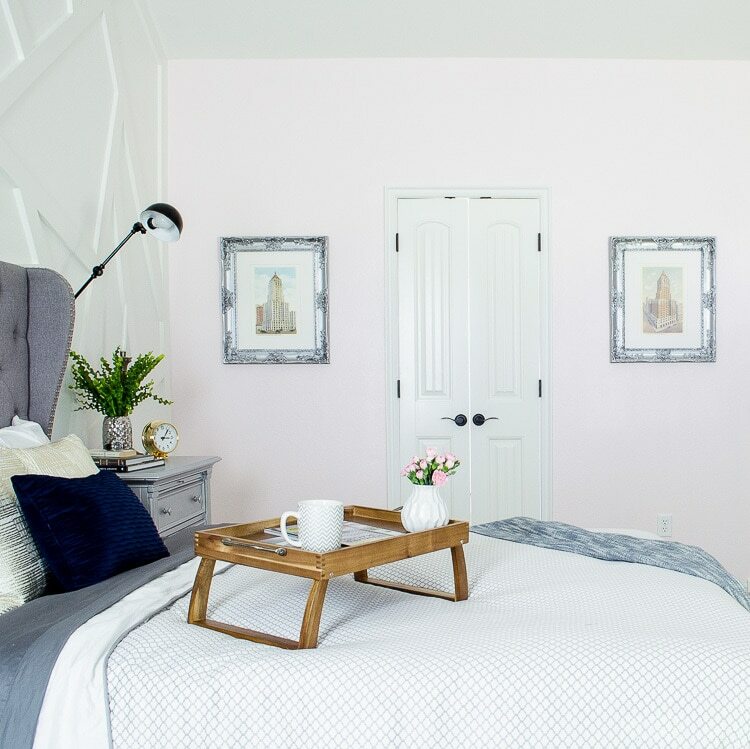 Linda from Calling it Home created this wacky One Room Challenge event, and because of her, FOUR rooms in our home are now better than we could have imagined. Thank you, Linda! 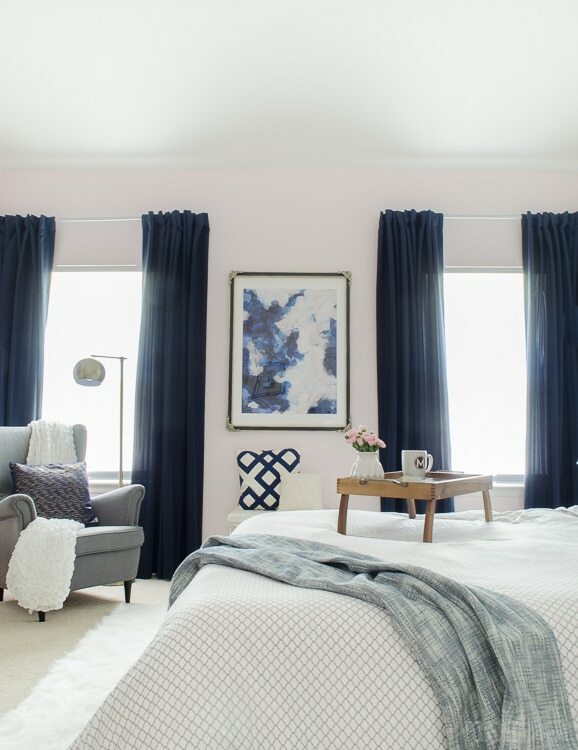 And then we have my husband, who let’s me do things like paint bedrooms pink and design crazy walls. Then he comes home after long stressful days at work and helps my ideas turn into reality. Without his help, none of my One Room Challenge spaces would be the same! That’s enough chatting, here come the photos! Let’s go back in time five weeks and remember what the bedroom looked like before. The after is almost unrecognizable, even though the furniture placement is the same. 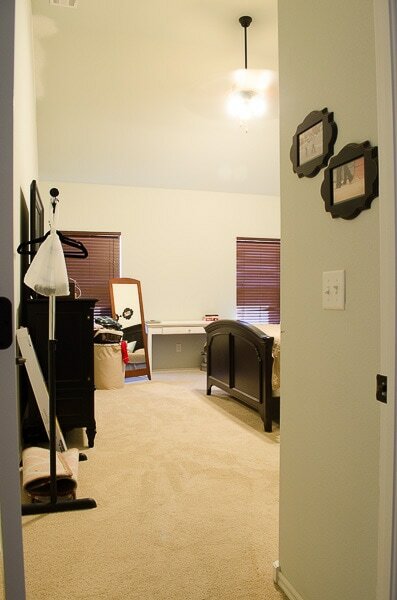 As much as I love our master closet, I think the bedroom photo is my new favorite of all time. Queue the total surreal feeling that the One Room Challenge brings me when a space is done. I feel very Urkel-esque – “Did I do that!?! ?” Of course, there is also a big dose of embarrassment that we lived in the before photos. The window wall before was a big mess of clutter and faux wood blinds that were way uglier in person. Now it looks like competent, responsible adults live here. Looks can be deceiving, right? 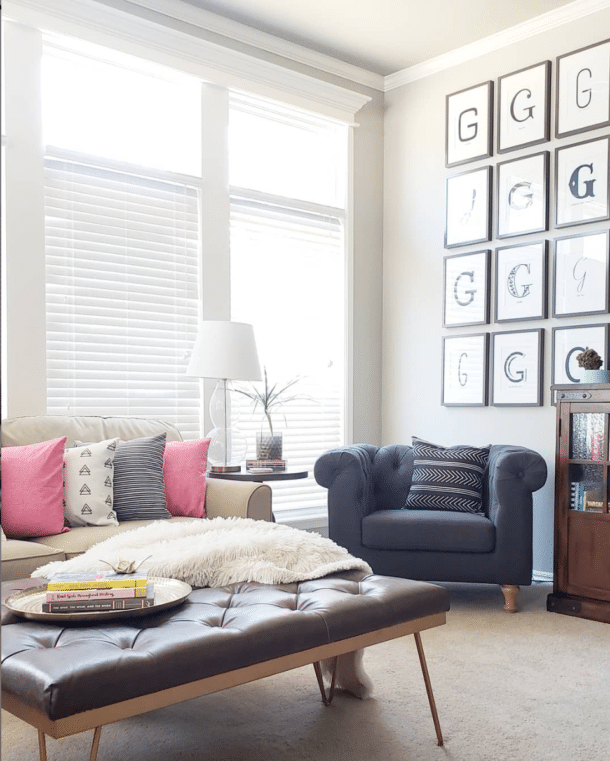 The art from Minted provided inspiration for the entire room. I couldn’t decide if I wanted to go dark and moody or light and bright in the space. When I saw the print, I realized it was possible to combine both together. It gave me the confidence to blend a glam uptown space with downtown loft inspiration. Kind of a wacky combo, but I love both of those vibes passionately and equally, so why shouldn’t I make our bedroom represent both sides of me? The bed wall also had a MAJOR transformation. The before was just sad. 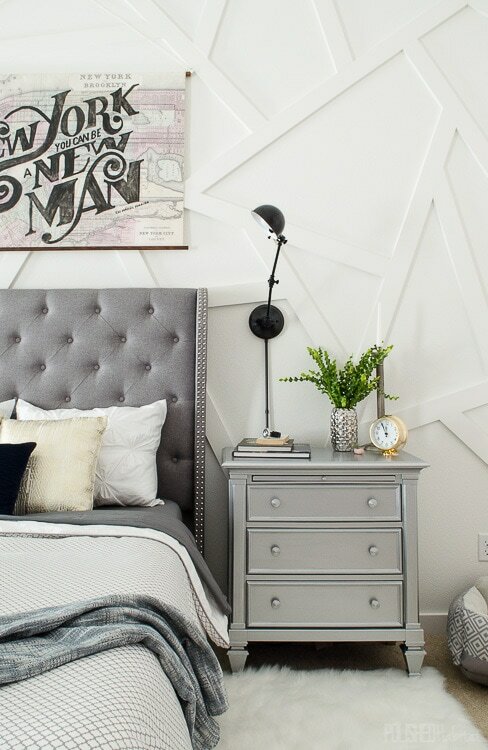 Oh, the modern accent wall. Measuring all those angles was beyond worth it! The artwork above the bed is a custom piece by my talented husband. We found a public domain map of NYC and had it printed to canvas. Then, he painted a quote from Hamilton/Lin-Manual Miranda over the top of it. We were beyond lucky to see Hamilton on Broadway right after it opened. Since then, we’ve been OBSESSED. It’s just so brilliant. Spinning around to the next wall, I finally found the perfect home for some vintage prints of my two favorite buildings in downtown Tulsa. I love that you can still see the art with the bathroom doors open. The final wall in the room used to look like this. Not exactly the most pleasant thing to see when you wake up. Now we have a gallery wall around the TV! Those big prints are by the talented Leigh Viner and you can find them on Etsy. I took the rest of the photos myself all around downtown Tulsa. I could never find the perfect chair at the right price, so I pulled a chair from the living room in temporarily. It wasn’t the exact look I wanted because it’s too similar to the bed, but sometimes you just can’t find the right piece on a deadline. On the left side of the TV, I needed something to balance out the chair. I brought in a bar cart to serve as a mini library. Now our books that are in queue to be read have their own space. On the bottom, I added a basket for new magazines. I’m so excited to have one spot for all our new reading materials. Before they’d get mixed in to the office bookshelves and forgotten about! Here’s a closer look at the photographs around the TV. I kept the dresser styling pretty simple, but love the wall-mounted air plants! The view walking into the bedroom from the hallway is SO much better now. Here’s the scary before as a reminder. Now it’s bright and happy with a bit of drama. 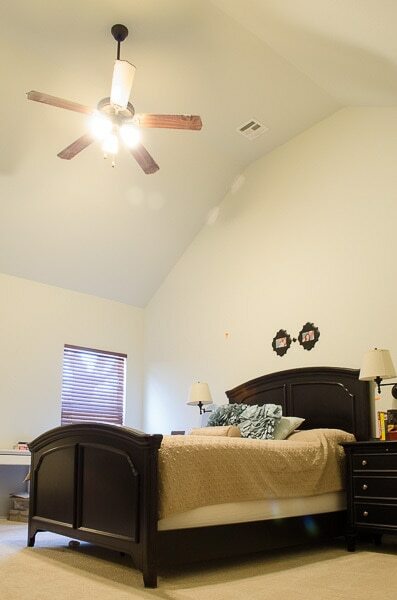 How great is that ceiling fan by the way? It puts out some serious air AND light too. We were worried it would be dark, but it’s brighter than our old ugly 3 bulb fan. The bench between the windows plays double duty as both a footstool and table for the reading nook. 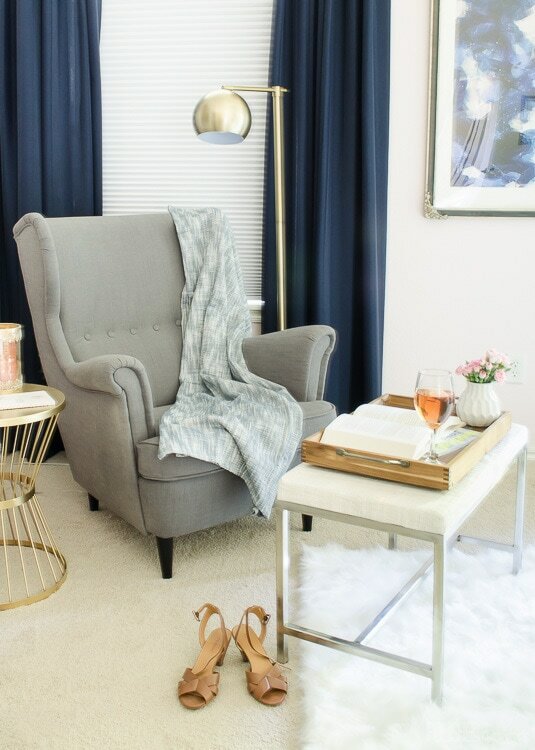 I think I need to find some office space outside the house just so I can come home from work, take my heels off, and read with wine in this corner. The breakfast tray also serves double duty as the perfect in-bed workstation! The window situation is SO much better than before thanks to SelectBlinds.com. Can you believe in the picture below there are actually privacy blinds letting in that much light? They are amazing! In seconds, they also transform to full black out blinds. If that wasn’t enough, there are NO ugly, safety hazard cords involved. The gorgeous navy drapes also came from SelectBlinds.com. I used their back tab curtains in Nautical Sateen. The room gets extra dramatic at night. And the fan looks so cool when it is moving. The center/light stays put and the blades rotate around it. Whew! That’s all the photos, but I’ve got a complete source list for you below! Some of my favorite brands jumped in to make this room possible by providing products and/or sponsorship. I wholeheartedly recommended every one of them! 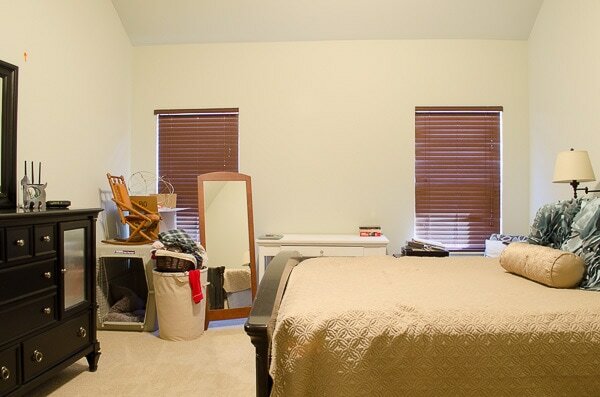 If you liked this space, you may be interested in some of my other rooms. 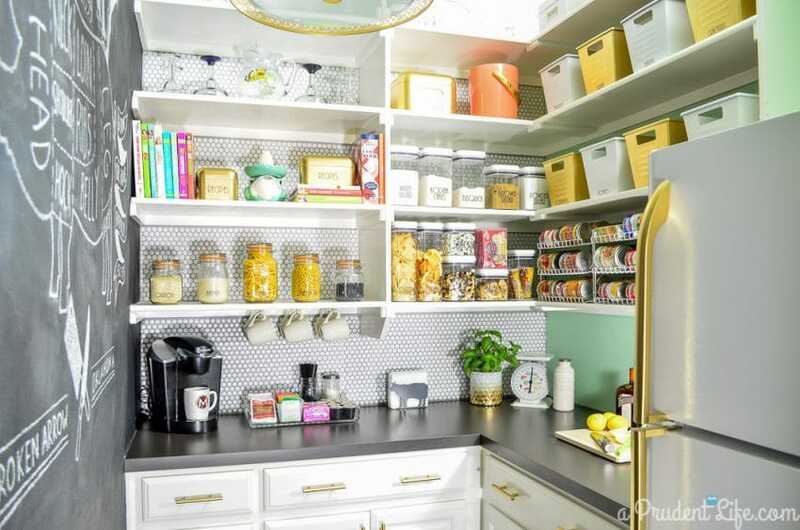 The closet and the pantry both have an infusion of glam as well! Your bedroom is so beautiful! The colors and textures are perfect for a calming, relaxed atmosphere and the styling is gorgeous. Love how creative the feature wall is and your husband’s art is so cool. Wow! 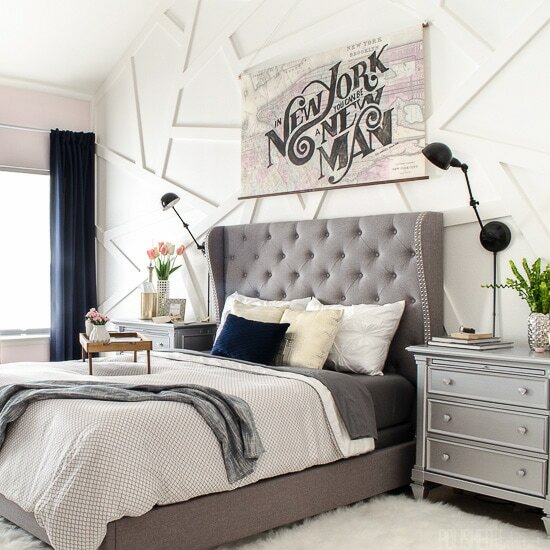 Such a gorgeous and definitely glam room! the moulding on the wall is so unique and very creative. I’m obsessed. You’ve got tons of talent! 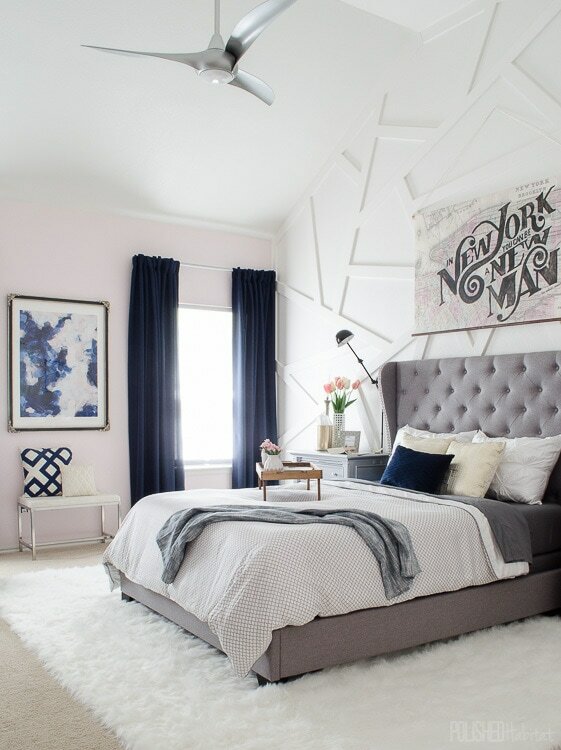 My bedroom still needs a makeover and I wish I could sleep in a bedroom like this one! I think I already said it in a previous post but this wall is just amazing!!! Um, WOW! You always rock these challenges so beyond belief and this room does not stray an inch from that! In-cred-i-ble. That feature wall? Art? Gallery wall? The bed!>!>! The furniture? I LOVE all of it. Awesome, Melissa. Sharing sharing sharing!! Oh my goodness, that is one transformed space! Unbelievable! 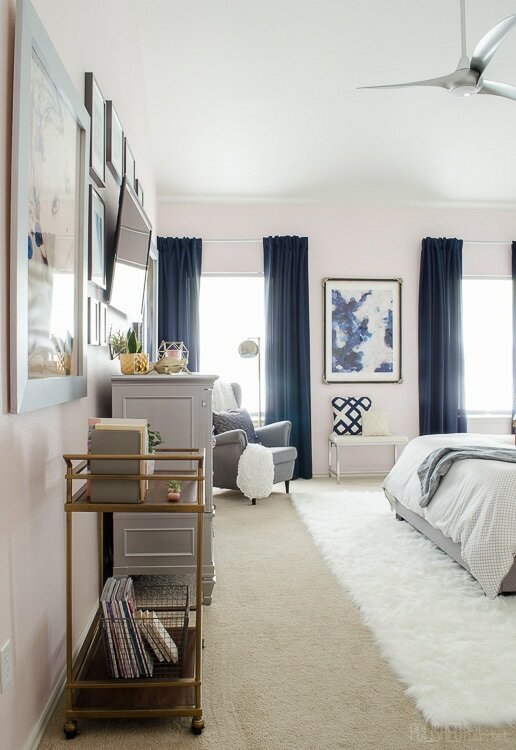 The accent wall is killer, the navy + blush color combo is AMAZING, and all the details you added work together to make this one of my favorite room redos EVER! Way to go Melissa! And your husband’s signature lettered art is a perfect finishing touch! 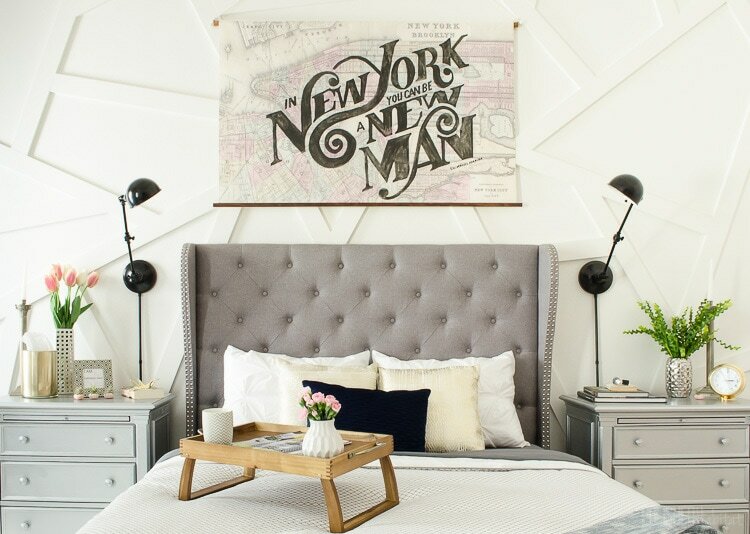 This room turned out amazing, but there are two things that I absolutely love: the wall (of course) which looks higher with the moulding, and the tulsa photos. I really like how they all go together and make a perfect gallery wall. This is awesome! Thank you, Mila! 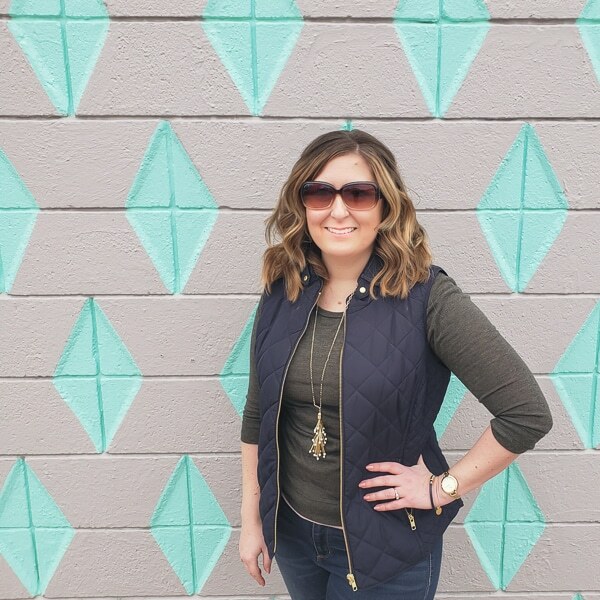 I got so lucky that the sky was such a gorgeous blue the day I went to take the Tulsa photos! It ended up tying them into the room even better than I planned. Amazing transformation… everything looks superb! This is seriously one of my favorite transformations! I love every ounce of it! You did an amazing job!!! Thanks so much, Nikki! I show the paint picking progress in this post http://www.polishedhabitat.com/2016/orc-week-2/ and in this one http://www.polishedhabitat.com/2016/paint-all-the-thingsorc-week-3/ – Really it was a bit of a suprise that I picked it, even to me! I had assumed I was going to go with a gray, but when I was having trouble visualizing whether I wanted a light or a dark and a warm or a cool, I thought I should flip through the swatch deck and see if anything else stood out. When I saw the pinks and thought about the art, wheels started turning! That week #2 post shows all 10 colors I tested for the room, and then the week # 3 shows the 1 gray and 1 pink I had narrowed it down to with the art against it. Thanks for reading!!! What a gorgeous makeover, Melissa! 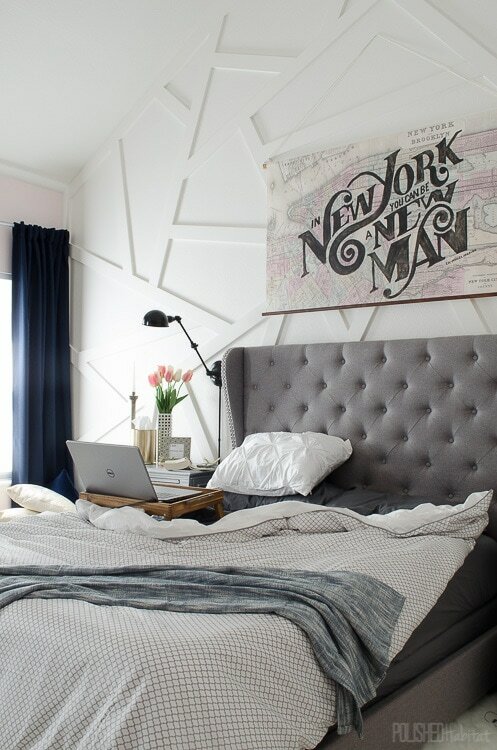 That wall is amazing and love the bed! Your room is so beautiful! I love the mix of artwork. The room is so cozy feeling now! You did a great job! I am absolutely floored and inspired by such a radical and beautiful transformation and I have to admit my boyfriend and I FLIPPED when we saw the Hamilton quote above the bed. As new New Yorkers as of a year ago, we got here right when the buzz had taken off and have been in love with the show ever since and are dying to see it in the coming years when tickets are available for the common folk again! Is there any chance your husband makes custom orders? Thanks so much for sharing! Yeah!!! I LOVE LOVE LOVE it when people fully understand the art behind the bed and love Hamilton as much as we do! Hopefully you’ll be able to get tickets once Broadway once they open in Chicago and/or the tour starts. We were SO lucky to get our seats when we did! So, my husband would do commissioned pieces, BUT they bad news is that he wouldn’t do Hamilton pieces because he doesn’t want to try to profit on Lin-Manuel’s genius. As much as we’d love to sell the art, we wouldn’t do it without going through licensing channels, even though other people do similar things all the time. So sorry! But if you had another idea and I went on that whole tangent for no reason, definitely email me ([email protected]) and we can chat about a commissioned piece! Thanks so much for the thoughtful reply, Melissa! Agreed. It warms my heart to meet fellow Hamilton enthusiasts! Thank you so much for the information. We do completely understand of course! Your husband is extremely talented and the painting is a beauty! We will give it a think if another non-proprietary idea comes to mind and reach out! This is a amazing and beautiful make-over. 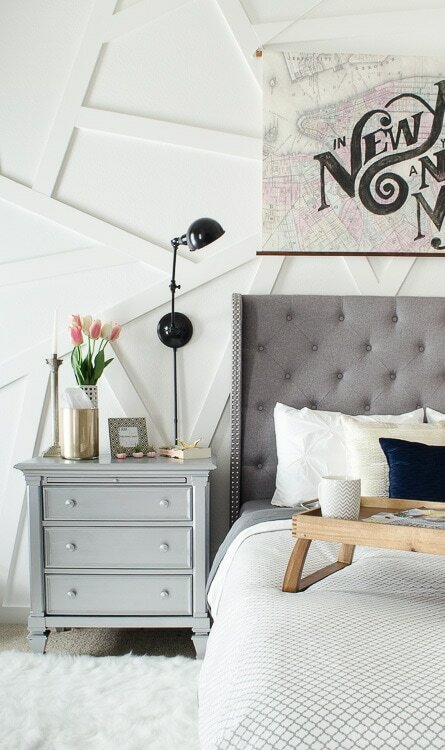 My husband and I last year did a similar headboard and everybody thought that we had a brought it from an expensive store. I just have one question about the feature wall behind the bedhead. What materials did your husband use for those angels on the wall? Hi Anjelka, and thank you! 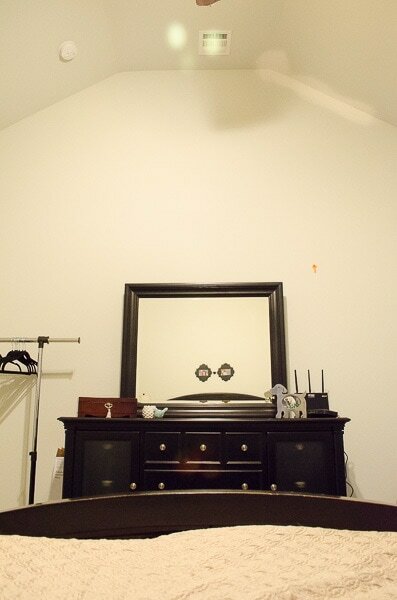 You can see lots more about the wall process here: http://www.polishedhabitat.com/2016/bedroom-feature-wall-orc/ We used prefinished 1×4’s to save time. Thank you so much, Vel! There were so many amazing rooms to choose from so I’m honored to be one of your favorites! 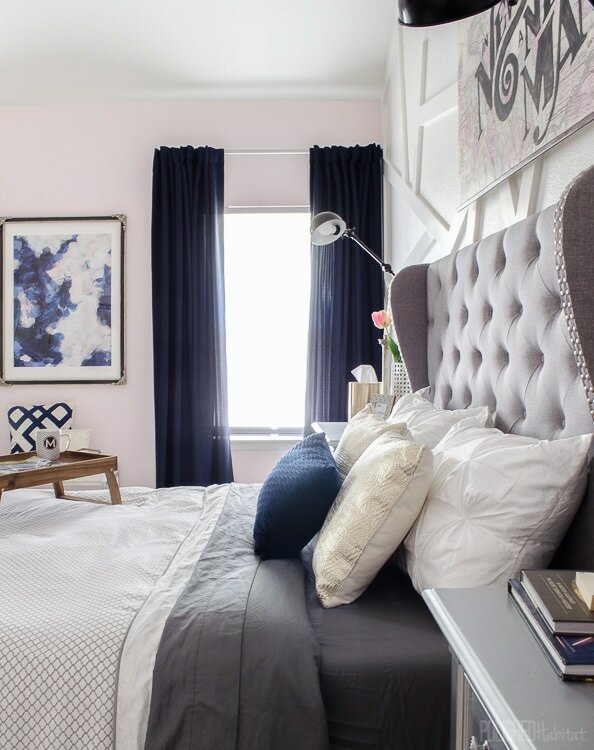 Ooh, amazing master bedroom transformation! 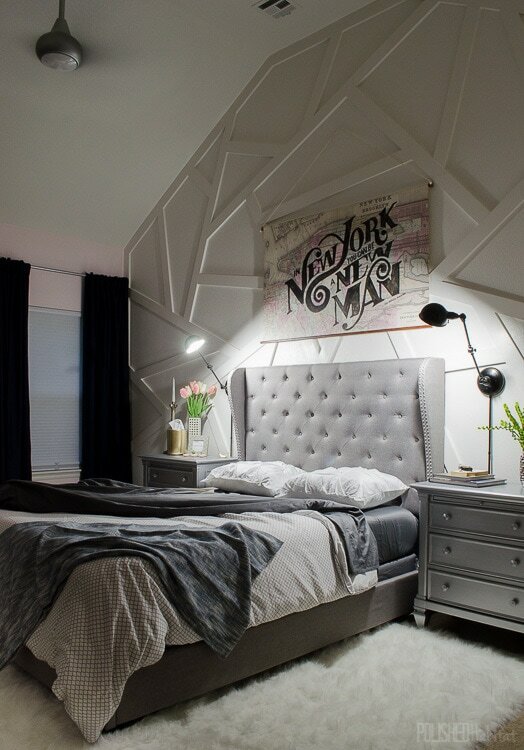 Did I miss the details about how you did the textured overlays on the wall behind the bed? 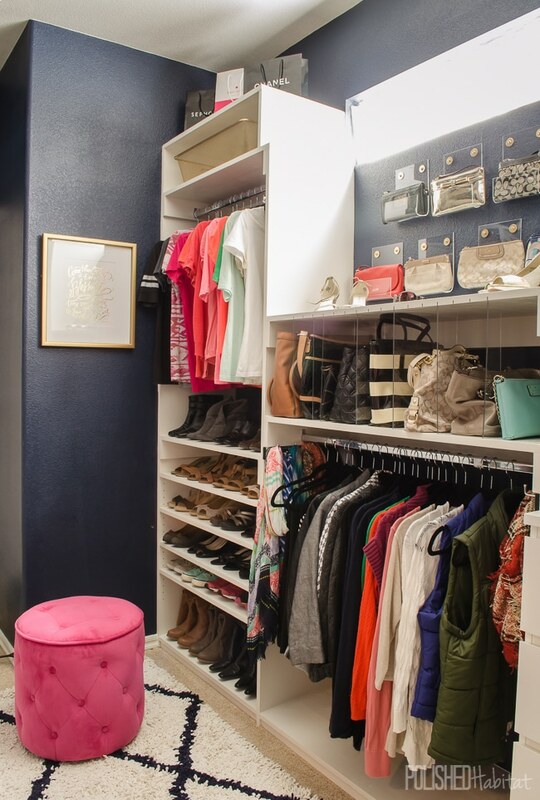 And oh-my-goodness-that-master-closet! Excited to have found your site. Amazing beautiful inviting I love that you reused some pieces your paint choice is fab!! Such an amazing room!! I almost never comment, but I loved that room. You did a fantastic job. Thank you, Suzanne! I appreciate you taking the time to comment!!! Fabulous job! You made great choices in tying together all of the finishing touches! Love it all!